The NFL Draft is finally upon us. Plenty of future NFL players will be waiting and watching to see who selects them to begin their NFL journeys. And for a select few, they get to walk out on the stage after they are selected by a team and sport their new team’s hat. But there are two players that will not be present at the Draft that many will be talking about. That would be the top quarterbacks in the draft, Florida State’s Jameis Winston and Oregon’s Marcus Mariota. Both have chosen to stay at home for the draft. Winston is staying at home in Hueytown, Alabama to be around family and around his grandmother, who would not have been able to go with him to travel to Chicago to see her grandson drafted. For Mariota, he said he was “important to him personally and culturally” to be at home and around his people in Hawaii when he is selected. While Michael Irvin may feel both are big-timing the NFL, both have their own personal reasons for not coming and that can be respected. But what happens when both are selected and it’s time to perform. In the case of Winston, he has had moments where he is too confident in his arm and takes too many chances, but he also has had some great moments where he put the team on his back and led them to a win. Some feel he may be a risk character-wise, but many scouts are not concerned about his play on the field. But in the case of Mariota., it seems that there is not a consensus on him. Some believe he will be a good pro quarterback, while others think he could be a bust. Mariota is hearing the criticism whether he acknowledges it or not and deep inside he is probably itching to make the doubters wrong. But other than the perception he has right now, he is also battling the quarterback perception of Oregon. Over the years, Oregon has become one of the teams that everyone loves to see. Their flashy uniforms tend to grasp the attention of high school kids and college football fans alike along with their winning ways. But what also grasps everyone’s attention these days is the speed they run their offense. It seems like they are running at breakneck speed when they are on the field. During the last two years, that offense has been ran by the talented Mariota. He would make things happen with his feet and also make things happen with the short passing game. He is a talented quarterback, but we have seen many a talented quarterback line up for Oregon before heading to the NFL. Going all the way back to Akili Smith, Oregon has not had a successful quarterback play in the NFL. Players that have played quarterback since Akili ar Oregon are A.J. Feeley, Joey Harrington, Jason Fife, Kellen Clemens, Dennis Dixon, Brady Leaf, Jeremiah Masoli, Justin Roper, Darron Thomas and the aforementioned Mariota. Out of these names, there are not many that have had any success at the professional level. Of all these names, Harrington was the one that had the most notoriety. He was drafted 3rd overall in the 2006 NFL Draft. Many thought that he would be a solid NFL quarterback because of the supposed skills that he possessed and his ability to think the game. But whether it was due to the dysfunction of the organization in Detroit or the bad play of Harrington, he never succeeded and he lasted only a few seasons before he was done in Detroit. He would go on to play in Miami and Atlanta in his career, but he never lived up to the hype that surrounded him when he came out of school. As for Mariota, he is definitely more talented than Harrington ever way. In fact, you could say that he is the best quarterback prospect to ever come out of there. But the stigma of the past will be something that will haunt him even though he probably has not thought about it. And with each bad pass and decision he makes, the reminders of what Akili Smith and Joey Harrington were will remain stuck in our minds. For Mariota to get rid of those stigmas, he has to come out of the gates strong. The biggest thing said about Mariota is that he has not played in a pro style offense. In the NFL, he will have to prove that he can handle the pro style offense. That means he will have to learn how to read defenses even more than he did in college. At Oregon, he only had one maybe two reads and then the decision was made. At the pro level, there will be more than that to read. He will have to see what the linebackers and secondary are doing and how they are adjusting to the motions and alignments of his team. The only way he could get out of having to read all these things is if he goes to Philly, where he would be reunited with his former college head coach, Chip Kelly. Another thing that he will have to do in the NFL is prove he can hit all the throws. At Oregon, he wasn’t asked to do so as much, but in the pros he will be asked to hit the difficult throws like the long outs. He has to be able to hit the difficult throws with regularity as well as the routine ones to make that stigma disappear as well. The more regular those throws come to him, the more he will not be compared to the former Oregon quarterbacks that played in the NFL. Today is the day the world changes for Mariota. No longer will he be known as an Oregon Duck. From here forward he will be known as the next former Oregon quarterback to make it to the NFL. And whether he wants it or not, he will be charged with erasing the stigma that has stuck with Oregon quarterbacks since Akili Smith and Joey Harrington. Can he erase the stigma or will he be adding to it is the question that he will be answering the rest of his career potentially. Is he ready for the task? The NFL Draft is on Thursday and there are plenty of highly-touted prospects. The main two, quarterbacks Marcus Mariota and Jameis Winston, have been taking most of the headlines and rightfully so. They both could have the potential to change franchises. Some view them as players that could come in and change the fortune of a team. But there is also the downside of what they could be. These two, for as hyped as they are, could end up being busts in the league and forgotten just like some other quarterbacks of the past like Dave Klinger and Akili Smith. After these two, the most talked about player comes from the one of the storied programs in the NFL. Defensive lineman Leonard Williams is a specimen of a football player. Standing at 6’5” and 302 pounds, Williams is viewed as an elite interior defensive lineman that could take over games at the next level. His power and athleticism at the position are something that people compare to current NFL player Ndamukong Suh. The comparison to Suh may be over the top to some, but to others they view him as a more under control Suh with the potential to be greater. Williams has made the plays to be given the hype that he has, but along with the hype there has to be some trepidation. Williams is a physical specimen, but there is a reason there are only a few positions available in the NFL compared to college football. And quite frankly, he may be the next in a long line of a special group of players, or at least a group of players that were thought to be extremely special. The University of Southern California has been one of the storied programs in football. From the days when Marcus Allen ran wild to the reign that Pete Carroll had over college football, USC has always been talked about as one of the elite college programs in college football. But unfortunately, over time they have become known for another thing in the NFL. The 1st round picks that have come out of USC have been some of the most talked about players out there. For example, everyone remember quarterback Matt Leinart and Reggie Bush? Both were hyped as the next great quarterback and running back in the NFL. In the 2006 NFL Draft, both Leinart and Bush were touted as two of the best players in the draft. The New Orleans Saints drafted Bush with the 2nd overall pick. They envisioned him as a back that could change the game with his elite speed out of the backfield and ability to line up in the slot as a receiver. Unfortunately, the most they got out of Bush in New Orleans was a change-of-pace back in their rotation. Bush was definitely dangerous when he had the ball in his hands, but he was never able to become consistent running between the tackles like he was catching the ball out of the backfield and returning kicks and punts. That led to him ultimately being jettisoned to the Miami Dolphins via trade in the summer of 2011. Bush has since played for the Lions and is now playing for the San Francisco 49ers in what is assumed to be a backup role. Bush has been productive in the NFL, but he has not lived up to the hype that came with him into the league. As far as Leinart, he was the quarterback that some envisioned to be the future star leading a team to a title. He did not have the greatest arm strength, but some looked at his success at USC and his ability to make big plays in the big games as things that could translate to the NFL. Leinart slipped in the 2006 NFL Draft to 10th where the Cardinals took him. They thought that he may be the answer to their quarterback woes. But unfortunately for him, there was a guy named Kurt Warner. The veteran quarterback came in and he took over the position. Leinart never even played well enough in his career to get the starting spot over Warner and quite frankly, he never deserved it over Warner. Leinart would eventually be let go in Arizona and would go on to play for the Houston Texans and the Oakland Raiders. And in those stops he again could not gain traction in his NFL career. The hype that surrounded him was never reached at any point in his career. The winning trait that many thought he had was proven to be more about the teammates around him than the actual talent he had. He was a good college quarterback, but many of the great college quarterbacks don’t make it in the NFL and Leinart joined that collection of players. These two players are just two examples of players from USC not living up to the hype that their 1st round selections garnered. Players like safety Troy Polamalu (picked 16th overall in 2003 NFL Draft) , outside linebacker Clay Matthews (selected 26th overall in 2009 Draft) and offensive tackle Tyron Smith (selected 9th overall in the 2011 Draft) have been great ever since they were drafted into the NFL out of USC. But for every great NFL player the last few years out of USC, there are some question marks like quarterback Mark Sanchez (selected 5th overall in 2009 Draft), defensive tackle Sedrick Ellis (selected 7th overall in the 2008 Draft), linebacker Keith Rivers (selected 9th overall in the 2008 Draft), offensive tackle Sam Baker (selected 21st overall in the 2008 Draft), wide receiver Mike Williams (selected 10th overall in the 2005 Draft) and defensive tackle Mike Patterson (selected 31st overall in the 2005 Draft). USC may be known for having good teams in the last decade, but they are also known these days for producing 1st rounders that have not produced at the NFL level. 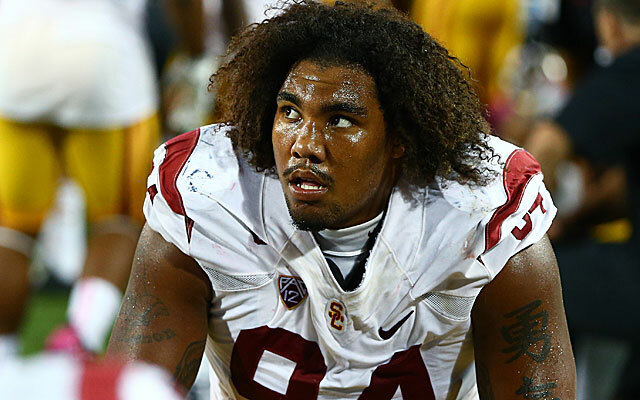 Leonard Williams was a great college player, but which way will he lean? Will he become a great NFL defensive player or will he become another one of the players from USC who had the hype train carry them to the NFL? The Chicago Bulls have finally dispatched of the Milwaukee Bucks and are headed to the conference semifinals. Their opponent has a familiar face starting right at them. The Cleveland Cavaliers swept the Boston Celtics to cruise into the second round of the playoffs. But the game the Cavs had to clinch the series was anything but smooth. The Cavs lost versatile big man Kevin Love to a separated shoulder during a fight for a loose ball with Boston’s Kelly Olynyk. And later in the game, Cavs guard JR Smith took a wild swing at Celtics forward Jae Crowder while boxing him out. The result was Crowder sprawled on the ground from the force of the blow. Smith received a Flagrant 2 foul and was ejected from the game. And the news came down on the fate of each player for the their matchup with Chicago. Kevin Love has been ruled out for the rest of the playoffs after surgery to repair damage from his separated shoulder and Smith has been suspended two games for his hit to Crowder’s head. In all actuality, Smith should have been suspended even longer than he was. The only reason he wasn’t suspended longer is due to it being the playoffs. But nonetheless, both will be out come Game 1 of the Eastern Conference semifinals and will be watching their team face off against the Bulls. Given the state of the Bulls and the state of the Cavaliers, it would be easy for many to say the advantage goes to the Bulls for this series. After all, they are the deeper and healthier team at this point in the season. But over the years, one man has always stood in the way of the Bulls and their path towards a seventh championship. Who’s that man you may ask? None other than LeBron James. Back in the 2010-2011 season, the Bulls had an outstanding regular season. They were the top seed in the East that season and many picked them to go to the NBA Finals on the strength of good defense and the play of MVP point guard Derrick Rose. The Bulls would make it all the way to the Finals and they would face the team that many wanted to lose so badly, the LeBron-led Miami Heat team. After the first game of that series, many who projected the Bulls to win the series were feeling really good about their projection. The Bulls handled the Miami Heat 103-82 and at that point had beaten the Heat four straight times including the regular season that year. But after that game, the Heat and LeBron owned the Bulls. The Bulls would not score over 90 points the rest of the series as Miami smothered them with suffocating defense and big-time play from LeBron. At that point, it just seemed like he could do no wrong against the Bulls and he was at their mercy. And just like that, the best chance the Bulls had to beat the Heat and LeBron had just went away, or so they thought. 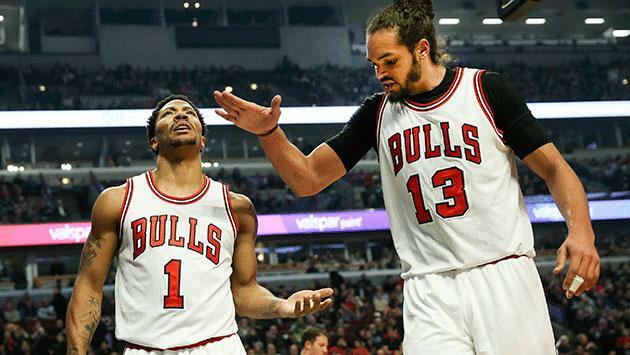 Over the years, the Bulls have been struggling with being healthy at the right time. It seems like every year since that series, the Bulls have been bitten with injury at the wrong time, especially with Derrick Rose. Ever since that series, the injuries have mounted for him and his absence has sabotaged the Bulls’ seasons. When Rose got hurt again this season and had to have knee surgery, many thought the Bulls would be headed down the same path they always do. But surprisingly to a lot of people, Rose was able to battle his way back in time for the playoffs. He has been off at times and spectacular at others, but the team around him is considerably better than it was in the past. As a result, the Bulls have the best team they have ever had around Derrick Rose. With Cleveland suffering the injuries and suspensions, the upper hand seemingly is with the Bulls this time around. But what has to be mentioned is the Bulls have been in this position before. They have been the favorite by many to win a series against a LeBron-led basketball team. And in each time they have failed to make it happen and capitalize. For the Bulls to keep their championship aspirations alive, they have to take advantage of this opportunity. The Cavs are there for the taking if the Bulls want to take it. But they also have to take away the will of a team that is led by the best player in the world. LeBron will undoubtedly be fired up to go against the Bulls. After all, he has owned them in the playoffs. As the Bulls have been suffering injuries at the wrong times over the years, LeBron has been enjoying the most successful stretch in his career and you can be sure he is going to fight to continue his successful run. You can expect he and Joakim Noah to get into some kind of talk or skirmish with each other. The two just don’t like each other that much and that will add to the excitement of this one as well. But the Bulls have a golden opportunity ahead of them and the King is the only thing standing in their way. We shall see what happens when the two collide soon. The Cleveland Cavaliers have been in control of the series versus the Boston Celtics from the beginning. It seems as if they were just toying with the Celtics, letting them come back in games only to distance themselves again and win. Heading into Sunday, the Cavaliers looked to end the series versus the Celtics and get some rest for the next opponent, presumably the Chicago Bulls. The Cavs expected the Celtics to come out and fight, but they certainly did not expect that to happen literally. Game 4 in Boston was a messy game. There was some nasty things that happened, but there were two plays that happened that caught the eye of many that watched the game and others that did not see it at all. Celtics forward Kelly Olynyk and Cavaliers forward Kevin Love were fighting for a loose ball in the first quarter when Olynyk inexplicable yanked down on Love’s arm. In doing so, he dislocated Love’s arm and then caused him to exit the game. The other incident that cause a stir happened between Cavaliers guard JR Smith and Celtics forward Jae Crowder. Both players were battling for position for a rebound on the floor when JR Smith took a wild swing behind him and clocked Crowder in the head. Crowder would leave the game with what was deemed a sprained knee, but it looked like he could have injured himself much worse than that with how dazed he looked. Smith was ejected from the game for that and could be seen clapping towards fans and smiling as he left the court. 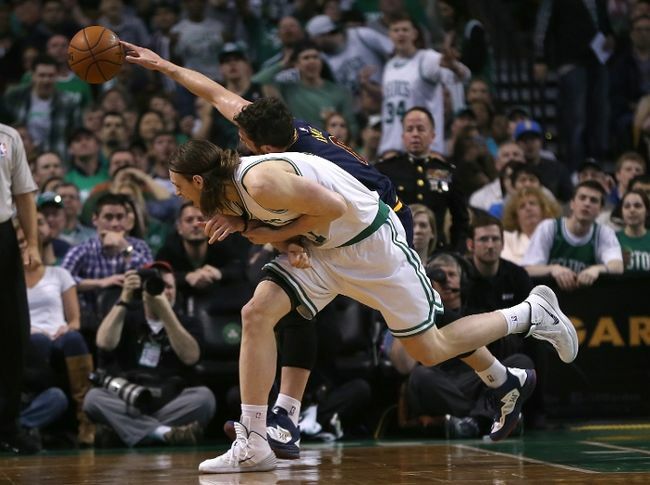 Both incidents could lead to missed games for Olynyk and Smith. For Olynyk, it could mean a suspension for him to start the 2015-2016 season. But for Cleveland, it could be an even worse thing for their starting guard. Smith could be suspended for the Flagrant 2 foul he was assessed after the hit on Crowder. And not only could he be suspended for the first game of their second round series, but he could be suspended multiple games. That would be a huge blow for the Cavaliers if Smith is suspended along with Love missing any time with the dislocated shoulder. Many are saying that both Olynyk and Smith should get multiple-game suspensions, but there should actually be more done than this. In the NHL, there is a physical nature that comes with the game. People get their teeth knocked out and their clocks cleaned when getting crushed up against the glass, but when an act happens that is deemed dirty, the NHL has the best policy in sports. When an act like someone hitting someone with a dirty hit that hurts a player seriously or other things dirty happen, the NHL takes the time to investigate the matter. Usually they dole out suspensions and they are done with it at that time. But in hockey, the criminal court system also takes a look at the issue at hand. They review the tape and they also can pin assault charges on players for their actions on the ice. One of the most popular examples of the court system getting involved in an on-ice incident is the Todd Bertuzzi/Steve Moore incident of 2004. Bertuzzi was playing for the Vancouver Canucks at the time and they were getting blown out by Moore’s Colorado Avalanche. In the 3rd period of the game, Bertuzzi was sent on the ice in a game that had been particularly ugly due to all the fights in the game. Moore had earlier got into a dustup with Matt Cooke of the Canucks and served a five-minute major penalty for fighting. Bertuzzi immediately came on the ice to instigate a fight with Moore and when he failed to do so in the 3rd period, he went after Moore. Bertuzzi grabbed Moore by the back of the jersey and hit him in the back of the head, knocking him unconscious. Bertuzzi would also land on top of Moore, driving his face into the ice. Some thought that was just payback for Moore, but it ended up being much more than that. Moore suffered three fractured neck vertebrae, facial cuts and a concussion as a result of the hit, fall and his face being drove into the ice. Moore’s career was unfortunately ended by that one hit. As a result of that incident, there were criminal assault charges issued against Bertuzzi and also a lawsuit against Bertuzzi and the Vancouver Canucks. Although the incidents that happened in the Celtics/Cavaliers game were not career-ending like what happened to Moore, the same rules could potentially apply, especially in the case of JR Smith and Jae Crowder. In the future, the NBA may want to look into the rules the NHL has. The NHL has fighting and things in their game, but they all know when to not cross the line. 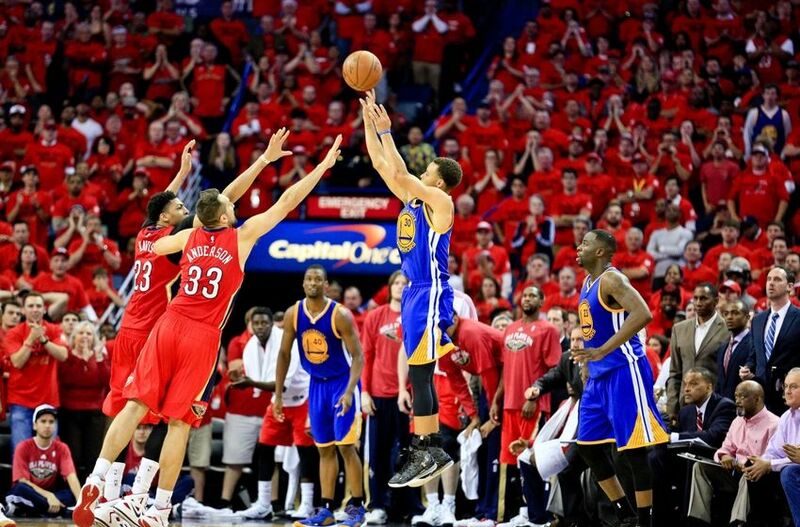 The NBA does not know that line and it can be blurry at times. Setting up this type of legislation would further set the tempo when it comes to incidents like what happened Sunday. If these rules were in place, Olynyk and Smith would potentially both be facing assault charges. Of course Olynyk’s incident would probably get less attention, but both would be in hot water if the courts were involved. But along with setting a tough line, it would also discourage the vigilante justice that can happen sometimes on the court and can distract from the game. Moving forward, the Cavaliers could be affected in both incidents of this equation. One of their top players this postseason could be limited for a while with a shoulder injury while another may be out for the rest a while after losing his temper and decking an opponent. The Cavs may have some issues when it comes to the second round because of these two incidents. And in the regard of the Celtics, they will probably be missing a player to start next season and Crowder could be injured worse than what was initially reported. Fighting and intentionally injuring players has no place on the court. Of course you can take up for your teammates, but get the other team back between the lines maybe with a hard screen or something like that, not something dirty and obvious to people. That isn’t smart at all. The growth of New Orleans big man Anthony Davis has been undeniable. He entered the league as a player with so much promise and not a lot of tape on what he could be offensively. Well, after three years in the NBA, he has shown that he was worth the number one pick, improving each and every season he has been in the NBA. And along with his improvement, the team has gotten better every year as well. This year, they even made the playoffs with a 45-37 record, although they lost in a sweep to the Golden State Warriors. Davis averaged 31.5 points and 11 rebounds or the series against the Warriors and he honestly could have done more if he was given the basketball even more than he was. The future seems bright for the Pelicans as they are a pretty young team and should learn from this experience. But before next season begins, the Pelicans are trying to lock up their most important piece. Reports are surfacing that Anthony Davis will be offered a max contract with the Pelicans that will pay him $140 million over 5 years. Of course that deal would be a no-brainer for anyone else on that team, but what does Anthony Davis want to do? Davis is definitely still reaching his ceiling. At only 22 years old, he has become a matchup nightmare for many big men in the NBA. And the crazy part is he can still get better with his game. The thing that Davis has to look at before he signs this contract is the team that can be built around him. As the team currently stands, only have five players under contract for next season (Jrue Holiday, Ryan Anderson, Quincy Pondexter, Tyreke Evans and Anthony Davis) and the Pelicans hold a $15.5 million option for guard Eric Gordon that comes off the books. And going into the 2016-2017 season, currently there are only three players under contract (Holiday, Pondexter and Evans). With the salary cap rising in the next two seasons, the Pelicans have some work to do to build the team around Davis. There will be plenty of players that will be available this offseason and next offseason to help the team get better. The question will be are the Pelicans willing to spend money to get better? If history tells us anything, the Pelicans organization, which used to be nicknamed the Hornets, may be willing to stick their foot in the free agent waters a little bit, but they have not been willing to go all-in for the talents needed to take them to the next level. Chris Paul was once the best player on this franchise. He would routinely make players around him better along with putting his own spin on the games. But over his tenure with the team, it seemed like the organization never brought in players that would complement his star power. The best player that he played with in his entire career with the franchise was David West. No slight to West, but the team needed more than him to make it happen. As a result, the team was never a serious threat in the Western Conference and eventually Paul left via trade for the Clippers. The organization seemed to want to spend money on players that could not make an impact that was needed to take them higher, instead spending money on role players hoping they would take it to another level with Paul as the point guard. Now the organization was under different ownership at that point and time, but there is no indication that this organization will make a good pickup in free agency. If Davis is paying attention to the history of the organization, he should hold off on signing that extension this summer. Of course there is always the possibility that he could get seriously injured next season. But what he should do is make the Hornets prove to him that they are serious about winning. The organization will truly be able to do so if they are serious about keeping Davis there. Then again, if they are not serious about winning, they may bring in some more role players that cannot make as much of a difference. The organization will have an additional $15 million freed up should they not pick up the option on Gordon and that could definitely make some things happen in terms of bringing a great player in to help take the Pelicans to the next level. Should Davis not sign the contract extension with the Pelicans, there are plenty of options out there available to him. Anyone out there would gladly make room for Davis on their roster. A team like the Los Angeles Lakers would have the contract of Kobe Bryant falling off the books after the 2015-2016 season. Although they have Julius Randle there as their current power forward of the future, Los Angeles would gladly move him to get the next superstar in the NBA. This is just one scenario, but the point is that Davis could easily pick where he wants to play and although he would lose one year on a max contract leaving the Pelicans, he may gain a team that would be more competitive and bring a better situation to his talents. 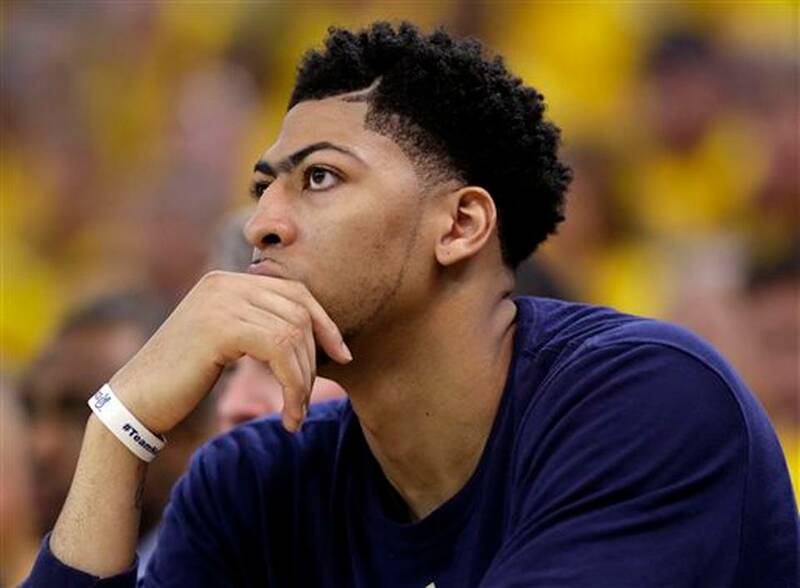 Only time will tell what Davis can and will do, but the smartest thing to do would be to play Poker with the Pelicans. He holds a lot of the cards with his star rising along with the salary cap as well. It should be interesting to see if he actually signs the deal, which he may do, or if he holds out until the following season like Portland Trailblazers forward LaMarcus Aldridge did. And we all see that Aldridge may be leaving the Trailblazers. Could this be the same path that Davis follows? We shall indeed see. The Toronto Raptors made a surge last season into the playoffs. A team that many were not sure about before the 2013-2014 season was led back by a small but strong guard that was working on his third team in his career, Kyle Lowry. It seemed like when he was traded there from Houston that he found a fit for what he does. He was the lead guard in a good system that allowed him to facilitate and also to be a scorer as well. It seemed like everything clicked for him. Lowry averaged 17.9 points per game and also dished out 7.4 assists leading the Raptors to the playoffs last season. Unfortunately the Raptors lost in seven games to the Brooklyn Nets, but the season last year was a success. And along with the success, the expectations for this season rose. Plenty begin to think about the Raptors and what they would be in the 2014-2015 season. And more importantly, the questions surrounded Lowry as to whether he would return to Toronto because he was a free agent. Well, despite the pulls of free agency and signing with another contender, Lowry decided to stay in Toronto. The Raptors and Lowry agreed to a four-year, $48 million deal to stay above the border and continue to build. The expectations were definitely that this team would be able to make a more serious push this season. And with Lowry at the helm, he was expected to be the main reason they made their push. Lowry was good during the regular season this year. He averaged around the same amount of points and assists he did last season although he was shooting the basketball just a little bit more than he did the previous season. One thing that was an issue with Lowry this year was injuries, but the team still was able to right the ship enough to make it into the playoffs, especially since they are in the NBA’s Eastern Conference. But the Raptors did not just sign Lowry for the regular season. He was signed back to take the Raptors further into the playoffs than they have gone since Vince Carter donned a Raptors jersey. But unfortunately, it seems like an old nemesis has arrived in a new city to disrupt that vision. Veteran forward Paul Pierce, who eliminated the Raptors last season while playing for the Brooklyn Nets, is on the verge of doing so again with the Washington Wizards. The Raptors have yet to get on the board against the Wizards in the playoffs and after the loss last night versus Washington, all hope seems lost with the Raptors. The team has not progressed as some thought they might. Shooting guard DeMar DeRozan has shown up for the Raptors. Although his shooting percentages have been pretty bad, he is playing hard and making an effort to make things happen while averaging 22.3 points in the playoffs. But the man that many pinned the Raptors’ playoff hopes on has been non-existent this playoffs. And ironically the guy that was the man for the Raptors last season has become just a guy on the team in the playoffs. Kyle Lowry averaged 21.1 points in the playoffs last season for the Raptors and carried them in the playoffs last season in the first round. But that seems like a distant memory when it comes to Lowry in this postseason. Lowry has gone from the face of the team to a man that some forget is on the court this postseason. His average has dropped from the 21.1 points last postseason to a paltry 9.3 points per game this postseason. This is a far cry from what was expected from him this postseason and has no doubt been disappointing to see. Each and every game it seems like John Wall gets the best of him, while he just cannot make things happen to offset what he is doing to him. Lowry’s assist-to-turnover rate is great, but he is shooting an anemic 23.8% from the field and an awful 18.8% from the three-point line. We know that he has battled injuries, but that is no excuse for what we have been seeing from Lowry this postseason. He is supposed to be the star guard alongside DeRozan on this team and he has been anything but for them when it has mattered the most. It is improbable that the Raptors will come back and win this series and much of the blame should be shouldered by one of the Raptors’ marquee players. He has pulled a disappearing act when it matters the most and as a result, the Raptors will be going home earlier than it was expected for them. The hot start they got off to at the beginning of the season is all but forgotten as they play out the string in the last games of their season. 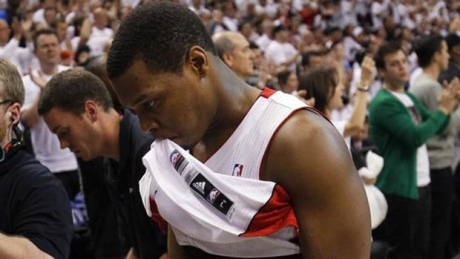 As for Kyle Lowry, the feelings of being the guy to bring the Raptors back will soon be replaced with the thoughts of potentially being overpaid. Of course the Raptors had to try and keep him there for the continuity of the team. And he isn’t the only one that has not shown up in the postseason for the Raptors. But he got paid to bring more success to the Raptors this season when it mattered. And as it currently stands, the Raptors will have the same results they had last season but in five games instead of seven like last postseason. The Oklahoma City Thunder have grown a lot over the last seven years. From a team that seven years ago was struggling to make the playoffs to a team that has made the conference Finals a couple times and made the NBA Finals once, the expectations have rose with each passing year. Scott Brooks has been at the helm for all seven of those years and has seen this team grow and mature. But over the years and with the expectations rising, there has been some disappointment. The expectation heading into this season was the Thunder would get a favorable seed and make a run deep into the playoffs. But it wasn’t the Spurs, Clippers and Golden State Warriors that posed the biggest roadblock. Injuries to Durant and Westbrook derailed their run. Their dynamic duo missing games caused the rhythm of the team to be off the entire year. And even though Westbrook had a ton of heroic games, they were not enough to take this team to the playoffs. After the regular season ended, the Thunder decided they wanted to reevaluate the coaching of Brooks over the years. And as a result, the Thunder relieved Brooks of his coaching duties. The firing of Brooks came as a surprise to some, but others looked at is as long overdue. From the questioning of his play-calling (or lack thereof at times) to the curiosity of his rotations, many felt that he was not the guy to get the Thunder where they wanted to go. And finally, the Thunder agreed to that thought by letting him go. The good thing about Brooks is he is not a terrible coach and will get another opportunity. The bad thing for him is that he will more than likely not have the same talents as Durant and Westbrook where he may be headed. Now that the shock has worm off from Brook’s firing, the Thunder have to move on. Even though it may have been a move that many did not like, it was one that management had to make. He had taken him as far as he could and there was no more he could do for that team. Essentially they were not going to win a title with him at the helm. So the question now is who replaces him? At this point, there have been two names that have been mentioned regularly since news broke that Brooks would be fired. One name is a shocker for some and the other is one that some could have pinpointed. Current University of Florida head coach Billy Donovan has been mentioned as a potential candidate to replace him. The mention of his name has completely shocked people, but he has went this route before in his career. He actually got the job with the Orlando Magic in 2007 only to have a change of heart and go back to Florida. So this foray into the NBA is nothing new for Donovan at all, but it is surprising nonetheless to hear he is interested again. The other name that has been mentioned is University of Connecticut coach Kevin Ollie. And although he recently said that he was not interested in the position, we all know that many a coach has said that before and still bolted for a new position. The name of Donovan is perplexing to understand. It’s fine that he wants to take a chance and go to the professional ranks, but is he really the guy that can make things happen there? One thing that college coaches struggle with when they go to the professional ranks to coach is control. In college, more coaches have control over any and all things and their players. And as a result, they are the ultimate control freaks in regards to what happens with their team at what times. In the NBA, that is one hard thing to do because players are grown men and not growing young men and the team has more control over things than the coach could ever imagine happen. Donovan may be up for a challenge, but the challenge of coaching Durant, Westbrook and the Oklahoma City Thunder is one that he should pass on. It essentially would be something that may go over his head. So, along with Ollie, there is another candidate that has not been mentioned at all and should be mentioned right now. His name: Mark Jackson. Mark Jackson was handed the keys to the Warriors when they were a bad organization back in 2011. The Warriors were a laughing stock at that time and no one really thought they would ever be back. But Jackson took that team and made them better each and every year he was there. The team was never known to be a defensive one and he actually got them to dig in at that end of the court. It was incredible watching their rise with the Splash Brothers, Klay Thompson and Steph Curry, making big shots while the team enjoyed their resurgence. But unfortunately, the resurgence under Jackson ended when Jackson and management could not get along anymore and he was fired to make way for Steve Kerr to be the next coach. Kerr may be very successful and has led the Warriors to new heights, but the foundation of that team was set by Jackson and he is to thank the most for them being relevant once again. Jackson is the type of coach that would command respect from Westbrook and Durant if he were to come there. The best thing for him in this situation is he has a team that is defensively sound already. The presence of big men Stephen Adams and shot-blocking extraordinaire Serge Ibaka would make things easy for Jackson to transition into coaching them. But where Jackson could make his biggest impact could be in being a leader for this team. In Brooks, many questioned whether he could make it happen when the chips were really on the table. He made it happen a few times for that team, but with the talent that they had, he fell short a lot of times as well. With Jackson, the Thunder would have a better leader of men on their sideline getting them going. The Thunder need a coach that can push them to be better than what they currently are because that will not be good enough in the West. Jackson is the perfect fit to be that guy because he is a motivator at his best. But along with the good things that Jackson could do, there is one thing that could bother some Thunder fans in regards to Jackson. There was often some criticism of Jackson in regards to how his teams did in crunch time execution. To be honest, Jackson may not be any better than Brooks in that area and that is something that motivational speeches cannot cure. If he is to take over the Thunder, he will have to improve that part of his coaching moving forward. If he does not, then there is the possibility that he could help usher in a new era in Oklahoma City that does not have Durant in a Thunder uniform. And that is something that Oklahoma City and its fans fear happening. Jackson is a good choice and the best thing that he has going for him over Ollie is he has previous head coaching experience at the NBA level. Jackson may have the experience in the NBA being a head coach, but Ollie has something that Jackson does not have: a past relationship with Westbrook and Durant. For those that are not familiar, Kevin Ollie was a journeyman backup point guard during his entire career in the NBA. He played for at least a dozen NBA teams over his career and is well-respected at the professional level. But there is one stop that he made a big impact on and could make an impact again as a coach. Ollie was in Oklahoma City as a backup point guard for the 2009-2010 season. He may not have played a lot on that team, but his impact was immeasurable on one of the Thunder’s key players, Kevin Durant. The elder of the Thunder stars, Durant was asked by Grantland about Ollie at one point in the past in regards to his impact on him and this is what he had to say: “I think he changed the whole culture here in Oklahoma City. Just the mindset, professionalism, every single day. And we all watched that and we all wanted to be like that.” This past comments about Ollie show that he earned the respect of the guys that he played with and that they hold him in high regard. These statements suggest that they would fall in line if he were named the coach of that team. Add to it that he knows the NBA game because he played it so long and you could be looking at a guy that could slide in seamlessly as the head coach there. But along with that, there is the matter of him saying that he is only interested in the University of Connecticut at this time. Honestly, it was believed that he would say that and many coaches have said what he said before. But even with that statement, it is not guaranteed that he will stay. At this point in his coaching career, it is not if he leaves UConn, but when he leaves UConn. The clock is ticking on him and he would be naïve to say that he would stay there and turn down the chance to go back to a place where he fought so hard to be successful. Donovan and Ollie may be the main names featured in this one, but Jackson is also a name that needs to be mentioned more for this job. All three may love to coach the Thunder, but there is only two names that make sense: Ollie and Jackson. Donovan may want a challenge, but can he really be the one to take them to a new level of success after Scott Brooks? The feeling is that he would be in over his head coaching two NBA superstars and trying to exceed the expectations that Brooks had. Jackson and Ollie, on the other hand, would fit well with the team and could help them take it to the next level potentially. But all in all, the team has to think long and hard about who the next head coach is because that decision could change the team for the better or for the worse. Durant and Westbrook are the key pieces as to this working and they have to be on the same page with the hire as well. 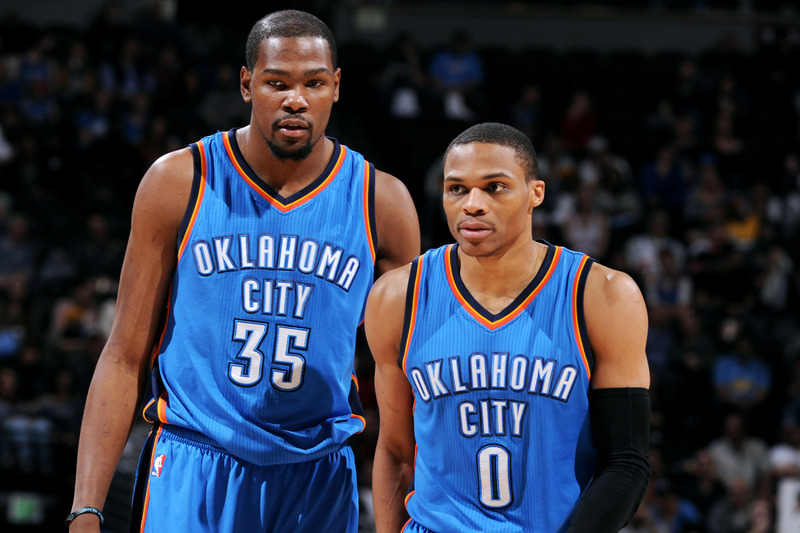 If they are not, the Thunder risk one or both leaving the team when their contracts are up. And that would be a situation that they would love to avoid if possible. It should be interesting to see how this all plays out. But needless to say, this decision on a new head coach is a big one for Sam Presti and the Oklahoma City Thunder management. 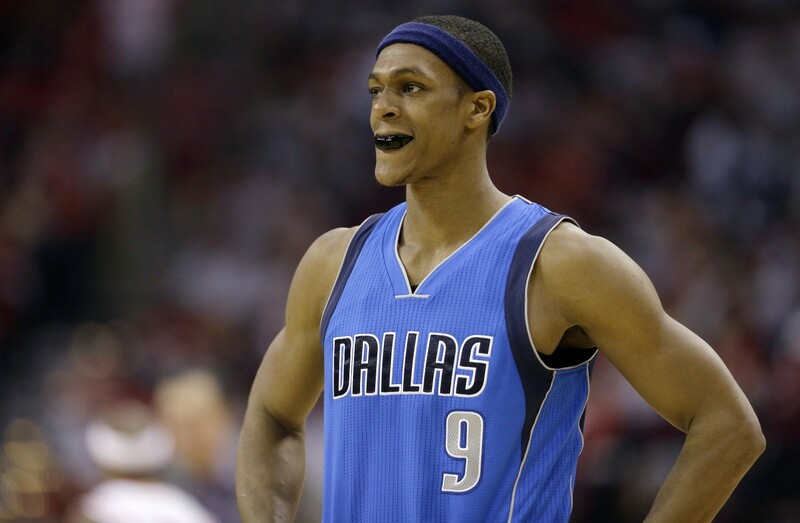 Essentially the Mavericks went for it all by acquiring Rondo and it did not pan out. And they essentially gave up their starting point guard( Jameer Nelson), two key reserves (forward Brandan Wright and wing player Jae Crowder) and the Mavericks 1st round pick in 2015. And in the end they were burned mightily as the marriage between the Mavericks and Rondo was toxic from the beginning. Rondo was a point guard that was used to running his own show. And Carlisle, as many have seen in his previous coaching stops, is a coach that likes to control things and run plays all game long. That mix was doomed from the beginning, especially with neither man giving any on what they were accustomed to. Many fans of the NBA have voiced their opinion on Rondo. Some are disappointed in Rondo and think he is just about over. Others have spoken of his past dealings following him to Dallas. And others even said that he quit. But the fans were not the only ones to talk about Rondo and his actions on the court. The NBA on TNT crew touched on the subject of Rondo on Tuesday after the game and as usual, there was some disagreement. Charles Barkley felt the Mavericks should go with Barea. It seemed to really both him that in this big a game, a player like Rondo would should up like he did. But on the other end of the spectrum, there was Shaquille O’Neal trying to deflect the attention off of Rondo. O’Neal, a former teammate of Rondo’s in Boston, touched on the coaching of Carlisle when it came to Rondo. He said many times that the Mavericks needed to “let him go” on the court and that Rondo could not play with the coach calling everything from the sideline. And he also went out of his way to dodge the conversation of talking about Rondo and went at Dirk Nowitzki, who struggled mightily against the Rockets in Game 2. All in all, it seemed like Shaq was more interested in defending his former teammate instead of openly criticizing what looked like a subpar and unenthused effort. But along with the talk of Shaquille O’Neal on the other things that went wrong besides Rondo, O’Neal was playing the part of owner without anyone even thinking about it. If you are not aware, Shaquille O’Neal has some ownership with an NBA team. In 2013, O’Neal became a minority owner of the Sacramento Kings. The team he once tormented and famously taunted by calling them the “Sacramento Queens” was not a team that he had ownership in. While O’Neal and new owners are now there, the fact still remains that the Kings have been stuck in neutral for a while. The team has not made the playoffs in almost a decade and they have not resembled a team that will make it in a while. But this season started with renewed optimism that they may make some noise in the West. The team was playing well under coach Mike Malone and they looked like they were finally getting it together. Big man DeMarcus Cousins was playing solid basketball and controlling his temper, small forward Rudy Gay was playing solid and new point guard Darren Collison was playing well. But all that optimism and excitement came crashing down when the Kings inexplicably fired Malone when the team started stumbling after a Cousins injury. The firing was viewed as a bad one by many people, but it was also viewed as a move Kings fans were used to them making. In the end, the Kings let Ty Corbin coach the team until they decided to bring in coach George Karl at the All-Star break. Of course the coaching change was not enough for the Kings to make a push this season and unfortunately, the combination of Gay and Cousins was not enough to lift them. That and the combination of a new system led to frustration by fans and frustration by Cousins, who at times looked like he was frustrated and took some plays off as well. Going forward change is needed and a shot in the arm is needed as well. Over time it was shown that Collison was not the guy and that Sacramento needed help there. Of course this season there was no help to be found the rest of this season. But this offseason, there may be an option that fits what they need. That option, you may ask, is Rajon Rondo. Many have Rondo already pegged to go to Los Angeles and play with Kobe Bryant, but can anyone depend on Bryant even being healthy ever again. And with the attitude that Rondo has displayed in Dallas, it seems that some may be souring on bringing him into their franchise. In Sacramento, there would be a chance of a blowup. You have DeMarcus Cousins who has had some issues with his attitude. Those two together could be volatile. But in the same breath, Rondo can be a person that could flourish in the George Karl system. Karl has had a free-flowing offense for most of his time in the NBA. Karl is going to have to taper some of that with the presence of a big man like Cousins. But imagine Rondo at the point guard slot for them being a one-man fast break and also being able to get the basketball to high-fliers Ben McLemore and Rudy Gay on the wings on a fast break. And in the halfcourt offense, imagine him breaking down defenses and making the job for Cousins a lot easier. Rondo would easily be the best point guard that Cousins had played with. Rondo is a free agent this offseason and there will be some teams that will fight over his services. That’s why Shaquille O’Neal was thinking two moves ahead when he did not criticize Rondo like the rest of his crew. He is a former teammate of O’Neal, but he is also making it look like he stood up for him in front of the nation. That could go a long way in helping Rondo make his decision. And assuming the money is right for Rondo, he could be wearing purple and black and give the Kings their best point guard since Mike Bibby in his prime. Rondo is coming up on what could be one of his last chances to make it happen in his career. His perceived lack of getting along with franchises has been a topic of discussion since his Boston days. But all in all, he is still a talented player. And with a big man, two wings in place and a franchise that longs for the days when they went crazy over players like Chris Webber and Vlade Divac, Rondo would be the magic elixir that Karl would need for his team. And in joining the Kings and potentially making them a team to be reckoned with, Rondo would rehab his image among some. He would go from a player many see as a malcontent to a guy that has resurrected a franchise that once had a team that was a contender. The sting from what happened in Dallas will stick with him and all of us right now. But they always say you are as bad as your last moment and as good as it too. In joining Sacramento, he could make resurrect his image and his ability to be one of the best point guards in the game. Under the tutelage of George Karl, he would be a special player for the Kings but first he has to decide to consider them. There is no question that he will be looking for more than just a good fit but a good place. And with Shaq taking a step in showing he still has love for his former teammate, Shaq could have made his biggest contribution to helping Sacramento as a minority owner of the team. 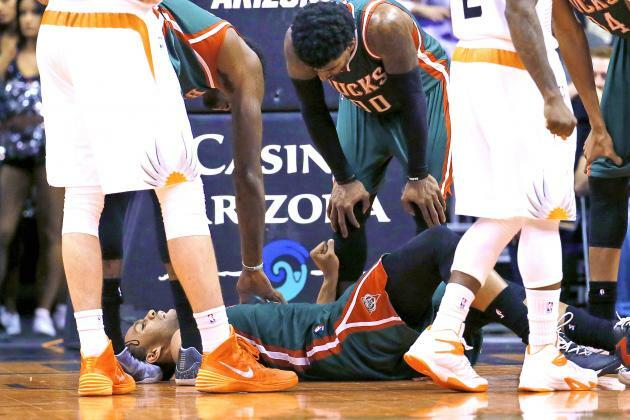 The Milwaukee Bucks headed into this season after suffering one of their worst seasons in franchise history. After a 15-67 campaign, the expectation was not very high for the 2014-2015 campaign. But with the addition of a new coach and new ownership, the Bucks far and away did better than last season. They finished with a 41-41 record, good for sixth place in the East. The stumbled a little after the trade of leading scorer Brandon Knight for Philadelphia 76ers guard Michael Carter-Williams, but they righted the ship enough to finish on a positive note in the regular season. This young team, with very little playoff experience, was headed into battle with the veteran Chicago Bulls, who have years of playoff experience up and down their roster. The Bulls were heavily favored by many due to their experience as well has other factors and this figured to be an uphill battle for the Bucks. But one key thing that truly shifted the dynamic of the Bucks matching up to the Bulls happened in Phoenix on December 15th, 2014. On that night, the Bucks were playing the Suns and rookie forward and Jabari Parker was having a pretty good game that night. He was 3/7 for 8 points in 15 minutes. But on a drive to the basket, Parker collided with Suns forward PJ Tucker and his left knee just gave weigh. Parker was diagnosed with a torn ACL and he would miss the rest of the season. Parker was only averaging around 12.3 points per game, but he was starting to figure it out more and more on the court. He had scored in double figures the previous four games and was starting to carve out his role on the team. And above all, he was the scorer the Bucks needed. Milwaukee is realizing how much they need him at this point right now. Heading into this series versus Chicago, it was known that the Bucks would have to muck up the game to give them a chance to win. They would need to be selective in running the court and get back to stop Chicago from running as well. In the first two games, the Bulls have been slowed in the transition game. Chicago had twelve points in the first game in transition and in the second game, they only allowed two points in transition. The problem that happened in Game 1 was the play of Derrick Rose, who was spectacular, scoring 23 points. And in Game 2, they gained the edge inside, but they also allowed Jimmy Butler to go crazy to the tune of 31 points and were dominated on the boards 64 to 48. The Bucks are now headed back to Milwaukee with a 2-0 deficit and are searching for answers. The teams hit some shots and made some things happen, but the piece they need for regularity offensively is sitting on the bench as a cheerleader for the rest of the season. Parker, although he is not the best defender, would have been a huge player to have on the team for the rest of the season and this playoff run. He can do so many things to make you feel uncomfortable guarding him. He can shoot, handle the basketball and also post up against opposing defenders. He truly was a matchup nightmare everytime he was on the court. And he was truly a scorer, something the Bucks only have one of right now in guard Khris Middleton. With Parker out there, the Bucks would have been able to make Michael Carter-Williams even more of a distributor and also would have allowed Giannis Antetokounmpo to focus on being a facilitator, finisher on the wing and a defensive dynamo with his size, athleticism and shot-blocking ability. Imagine a tandem of Antetokoumpo and Parker running the wings with Carter-Williams running the point. That would be extremely dangerous and hazardous to anyone that decided to jump when Parker or Antetokoumpo attacked the rim. That lineup would have put even more pressure on the Bulls to perform offensively. It also would have allowed the Bucks to capitalize even more on the turnovers the Bulls had in the last two games versus Milwaukee. The presence of Parker on the offensive end would also have helped the Bucks shooting the basketball. The Bucks have not shot over 40% in both games in the playoffs. They have very little consistent outside shooting on their team and that has helped contribute to the sub-30% three-point percentage as well. In Game 1, the Bulls were hot from the field and the Bucks could not hit enough shots to catch up. And that was the big reason behind their loss in Game 1. In Game 2, the reason the Bucks could never really run away from the Bulls was because they could not knock down shots consistently. And because of that, the Bulls were able to figure it out offensively without having to worry about the Bucks doing much. Parker was smooth on the offensive end and his shooting percentage reflected the smooth game he had. Parker was not the quickest guy at his position, but he was a guy that could hit the open shot. He shot almost 50 % from the field this year and when he got his opportunities to make it happen, he was efficient with his game, using his handles as well as his pullup jumper. All the Bucks needed was someone to knock down some shots to help them put away the Bulls early when they had them down in Game 2. They could have used Parker’s offense at anytime in Game 1 because the Bucks were simply not able to keep up with the Bulls offensively. The loss of the rookie out of Duke has hurt them bigtime right now. And the hope for this season is slowly fading away. Heading into Game 3, the Bucks can only hope for the tide to turn in their direction. They will be at home and hopefully their fans will show up and support them. Chicago isn’t far away and there will definitely be the presence of Bulls fans in the arena. But for the Bucks, the experience they gained in the playoffs so far should help them grow as a team. It also would help if they had their young wing scorer available to them. But alas, he is out for the rest of the year. And with him out, the case for them to give the Bulls issues was dismissed before the series even started.